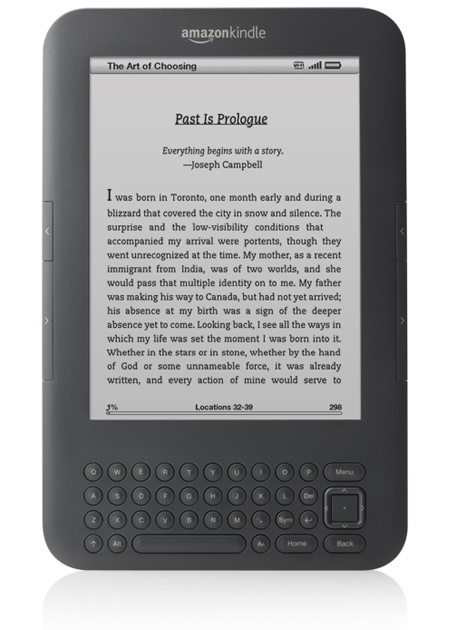 This is the new Amazon Kindle 3. The new version is now available to buy in pounds on the Amazon UK store instead of just the US one. There are two versions available. The traditional 3G version and a new wi-fi only model. The wi-fi one makes more sense to me as it’s considerably cheaper and also has better battery life. I would never really see myself needing to download books when I’m away from home so I don’t see the benefit of 3G for the vast majority of people. If you’re going to go away on a long trip, it would be hard to find the time to get through even a handful of books, and you could easily load up enough to last the trip before leaving home. I therefore can’t see many people opting for the 3G version, even for only £30 more, it just seems unnecessary. For £109 I may consider jumping onto the e-book bandwagon. I’m not a big reader at the moment to say the least, but I do want to get into reading again and anything that combines a traditional medium with a high tech delivery method intrigues me. Not only that but I feel that the traditional printed book is not really needed now due to the fact that printed words are so easy to replicate now in a device like this. The benefits far outweigh the negatives in my opinion. The price of admission may be high of course, but there are many free books available, and the space saving aspect is a huge selling point for me. As far as the Kindle 3 itself, it looks like a solid improvement to an already very competitive product. I’ve already tried out the Kindle reading apps for iPod Touch, Mac and PC and how their downloading, archive and page sync systems work are excellent. I feel like a member of the Kindle reading family, and I don’t even own one of the devices yet.